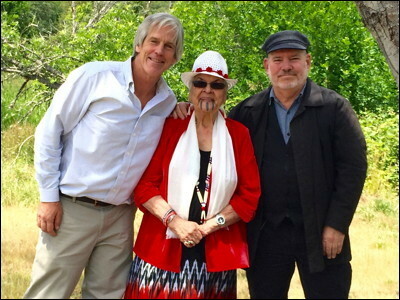 Stephen Kiesling, Agnes Baker-Pilgrim and Thomas Doty at Ti'lomikh along the Rogue River, home of the Sacred Salmon Ceremony. They were interviewed by Alex Chadwick for this story. The series is produced by Katie Davis. The Story Chair. We travel to the Rogue River in Oregon where the Takelma Indian tribe lived, before they were massacred by gold miners and forced to a reservation. When they were driven off the land, they took with them a memory of the river, a rock, and a tradition lost. Our producer Katie Davis knew she had something special when she came upon an article by Steve Kiesling detailing his quest to develop a whitewater park. While the idea of building this park was interesting and ambitious, it was what happened while undertaking his task that is truly unique and attracted us to the story. Usually when you find out your land could be the home to a sacred Indian tradition, you keep it to yourself. It's like finding an ancient Indian burial ground, most developers only see years of delays and lawsuits, but Steve went in the other direction. With storyteller Tom Doty, he reached out to the Takelma tribe and working with elder Agnes "Grandma Aggie" Baker Pilgrim, they set out to find the story chair where Grandma Aggie's father last conducted the ceremony several generations ago. This was no small task, as you have to traverse class four rapids to get to the story chair. But working with an old picture that Grandma Aggie provided, Steve and Tom did find it. Of course Grandma Aggie had to see this for herself and after years of protesting Steve finally acquiesced. It's not that Steve wanted to keep Grandma Aggie away, he honestly did not want to be responsible for the injury or death of the tribes oldest living member. But finally in 2011 at the age of 87, Grandma Aggie prevailed and with the help of several Olympic caliber athletes they planned and executed a course through the river to get Grandma Aggie to the story chair as safety as possible. This run is, of course, now called Grandma's Run. It was seven years later when we met Grandma Aggie and she is no less formidable now than she was then. She drove herself to our location and we all instantly clustered around her listening to her stories. However, unlike Grandma Aggie we were not able to go to the story chair as we did our recording. So, like the Takelma before the rediscovery, the sacred site was a state of mind for us. As we leave Steve, Tom and Grandma Aggie it is interesting to think that by finding the story chair a culture that has been fractured and almost lost, can begin to be put back together again. Thomas Doty with Alex Chadwick and Katie Davis at Ti'lomikh. They just finished recording an interview for this episode of Salmon Nation Radio.